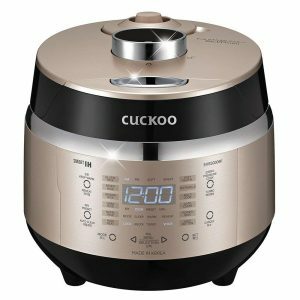 After 12 hours of research and through thirteen top rated induction rice cookers we are happy to say that the Cuckoo Electric Induction Heating Rice Pressure Cooker is the best induction rice cooker available online! 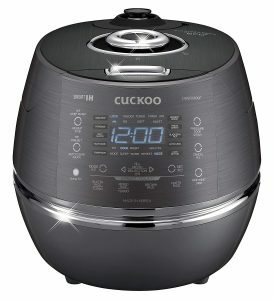 With its convenient make up, consistent quality whether it be white rice or brown, and extremely fast cook times Cuckoo delivers a great induction rice cooker for all of your beautiful, rice eating needs. This beautiful rice cooker will make you feel like the chef at a Michelin star restaurant with its sleek gold exterior and proficiency in three languages! Yes, you read that right – this rice cooker is multilingual! I don’t know about you, but I enjoy having appliances that are smarter than me. The LED lit screen may feel a little overwhelming at first due to the extensive number of options available, but soon you’ll realize that you can make literally any dish in this little gem. Cuckoo even incorporated an intelligent cooking algorithm to take all the frustrating guesswork out of cooking! You can’t mess up with this one. Not only do the quick menu settings of this cooker feature every kind of rice eaten by mankind, but also features a separate umami setting that is unique to this specific brand. Unknown to the Western palate, umami is a fifth taste in addition to sweet, salty, sour and bitter. It translates to “savory”, meaning in this setting, the rice is soaked for a longer period of time and allows the starchy sugars from the rice to completely be released for a greater depth of flavor. Have you ever tried those yummy crispy rice snacks at an Asian grocery store but never seemed to figure out how to make them yourself? 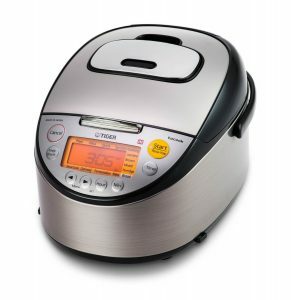 Worry no longer, because this rice cooker has a preset feature for crispy, golden scorched rice! Does that sound like music to your ears? Good, because this cooker features interchangeable melodies for you to pick from. If you enjoy cooking for large parties, then this rice cooker will definitely match the demand for large quantities. Even if you don’t enjoy cooking in large batches, this cooker will make the job easier with its maximum capacity. Bigger than the sheer size of this device are the numerous extra features that make this much more than just a rice cooker. Its one-touch controls let you turn this appliance into a pressure cooker, rice cooker, sauté pan, steamer, warmer and even a cake maker! For those of you who live busy lives and are always on the go, this device features a twenty-four hour delay feature in addition to a ten hour automatically activated keep warm feature. What does this mean? You can whip up dinner even before the day starts and come home to warm, hearty and delicious food that’s ready to be served! Meal prep can become a breeze with the help of this handy assistant. Why an Induction Rice Cooker? 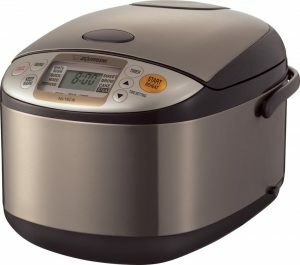 What is a Good Induction Rice Cooker? Another beautiful rice cooker by Cuckoo, this version also features voice guidance in English, Korean and Chinese. In addition to these smart features, this rice cooker can hold a larger capacity of uncooked rice to feed a larger crowd. Who wouldn’t want more helping of hearty rice? The shiny gray exterior would look lovely against any smooth, granite countertop. For those of you who enjoy cooking, but don’t enjoy the aftermath of dealing with dirty dishes, then you will love the auto steam cleaning option on this model! No more scraping rice off the bottom of the pot for you. Another Zojirushi rice cooker featuring its special induction heat cooking technology, this one also contains a triple heater in the build. This means that three separate parts, including the bottom of the cooker and the lid, can induce heat to make sure that the food is thoroughly and evenly cooked. It features three separate cooking options for brown rice to promote a healthy diet, which include regular brown rice, GABA brown rice and germinated brown rice. For those of you who don’t prefer the taste of brown rice, you may enjoy germinated brown rice due to its improved taste and texture. There’s also a separate cooking setting for jasmine white rice, which requires a slightly different preparation than other types of rice. The fun part about this cooker is that you’ll hear a sweet melody when its time to eat your perfectly cooked rice! There’s no disappointment there. 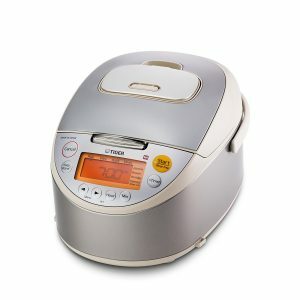 This unassuming rice cooker is nothing but versatile in its ability to cook a wide variety of rice types to perfection! It can also double as a steamer with the included steam basket and steamer setting. The cooker also features a separate cake setting to make deliciously fluffy pastries! 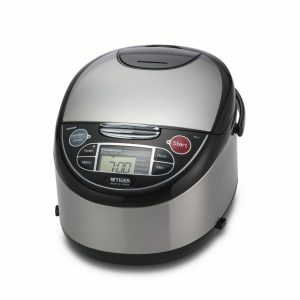 This rice cooker also features microcomputer technology that automatically senses the type of rice being cooked that day to make minor adjustments to temperature and produce perfectly fluffy rice, regardless of the type. 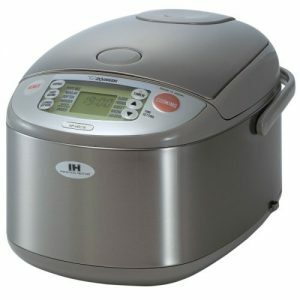 This is especially important for both novices and avid rice eaters who want a dependable rice cooker. This compact rice cooker stores and travels easily for small families, students and those who are always on the go but can’t live without a healthy serving of rice! 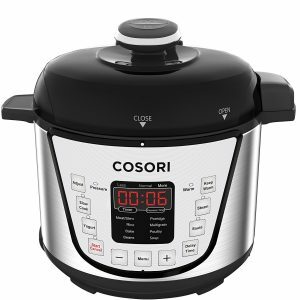 This one is also the most affordable rice cooker on the list. Don’t be fooled by the size of this pressure cooker because it has the capability of doing seven different things, including making yogurt! Even for those who are new to cooking, the preset options will take care of any issues. Simply throw in all the necessary ingredients and push a button to get started! With a time setting of up to a twenty-four hour delay, you can leave for work in the morning and come back to a nutritious, warm dinner. If you hate cleaning, all the accessories of this rice cooker dissemble to be dishwasher safe. 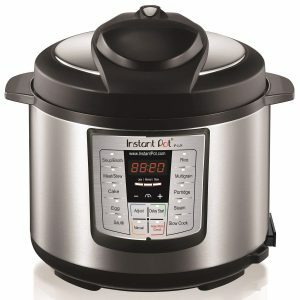 The nice thing about this device is that it primarily cooks by locking the steam inside and relying on the induced pressure to speed up cooking time. This means that only a minimal amount of the nutrients are lost from the meal during the cooking process, ensuring that you’re eating a healthy and wholesome diet! This white rice cooker comes in a no frills, compact and reliable design that will snugly fit into a corner on the countertop. 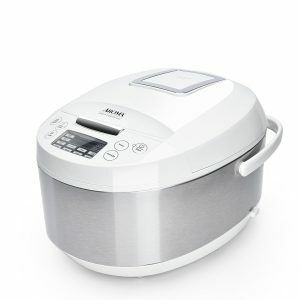 The unique part about this particular rice cooker is that it comes with a ceramic inner pot, which is much healthier to eat from compared to the basic nonstick pots that tend to come with most basic rice cookers. This not only makes the pot stovetop safe should a transfer ever be necessary, but also pH balanced to promote good health. For those of us guilty of being clumsy in the kitchen, the exterior of this cooker features a cool-touch surface, protecting us from burns! There’s also a convenient handle to move the rice cooker with, preventing butter fingers from letting the cooker slip. The settings on this device are perfect for a novice chef, with options preset for various types of rice, porridge, grains, reheat feature, soup, steam, slow cook and even yogurt! Who knew rice cookers could replace microwaves at their jobs? This rice cooker is one that shouldn’t be judged by its cover. Although the chic gray, stainless steel exterior and simple digital display exude an aura of minimalism, the patented induction heating system preaches the art of perfectly cooked rice. This technology fine-tunes the internal temperature of the cooker throughout the duration of the cooking process. Whether you prefer white rice, brown rice, jasmine rice, sushi rice or enjoy mixing things up, you can experience perfectly cooked rice with each serving! If you enjoy multi-tasking, then you will love this gem! This appliance not only features an adorable tiger logo, the company’s namesake, but also features patented synchro-cook technology with the detachable Tacook plate. Although there’s a whole lot of science involved behind the heat distribution and convection current that makes this possible, all you have to know is that you can have the side dishes and rice prepped, cooked and served all at the same time! Is this lazy or smart? Both, obviously! 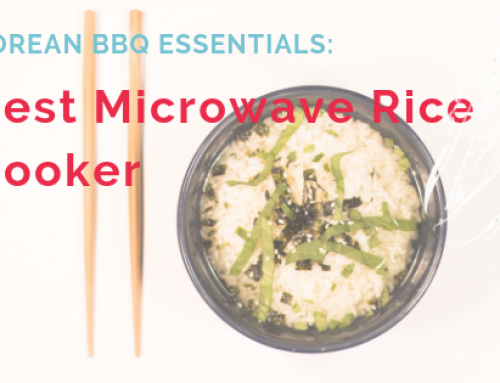 This dependable rice cooker features all the basics to get you started on your rice-eating journey. The compact size makes this the perfect touch to any small kitchen of a single person or a smaller family. 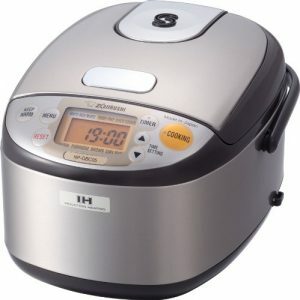 In addition to all the typical presets for various rice types, this rice cooker also has a rinse-free setting for those of us who don’t have the time (or effort) to thoroughly clean the rice before setting the cooker. Zojirushi also has the induction heating technology that promises perfectly cooked rice after each cycle, in addition to an automatic keep warm setting that activates reliably to keep food fresh and ready to serve. 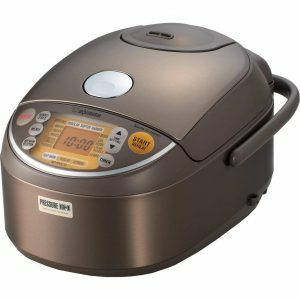 For those of you who are extremely picky about the texture of your rice (you know who you are), this is the perfect rice cooker for you. This particular version of the timeless appliance from Tiger features three separate cooking settings for short-grain white rice: plain, ultra and quick. The plain setting speaks for itself, being the most vanilla method of cooking rice. The ultra setting brings out the savory, sticky texture of the starch content in white rice as well as a sweet undertone to the flavor. The quick setting works well for those who forgot about the rice or for those who can’t handle hunger pains, like me! Yet another Tiger rice cooker that features the innovative Tacook plate, you can cook the main dish, side dishes and the rice at once with nothing more than some prep time. The dish prepared on the Tacook plate will slowly cook with the steam produced by the cooking rice, leading to a healthier and more nutritious final product. No unhealthy oils will have to be added to the cooking process! You won’t have to worry about the flavors of the two dishes merging due to Tiger’s innovative design. To help you get started, this rice cooker also comes with a Tacook Cook Book, which will be your expert guide to all the possible one pot meals in this little device. 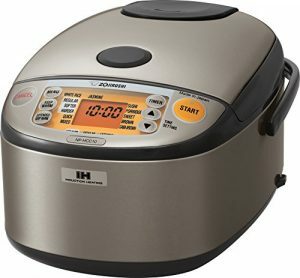 In addition to that unique capability, this rice cooker comes with ten cooking presets with two separate delay timers and an automatic keep warm setting that works for up to 12 hours. It can also double as a slow cooker depending on your needs. In all honesty, this isn’t a question you will truly be forced to make when looking at rice cookers nowadays. The vast majority of rice cookers are induction, I don’t think that i’ve seen a non induction rice cooker since my janky old one I took to college with me. 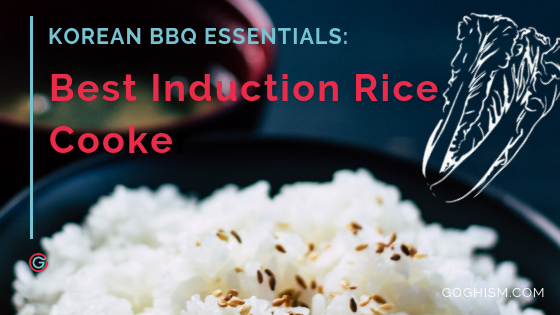 The benefits of induction are perfect for cooking rice as you are ensured even, measured temperature increases as well as an overall safer product on your counter top. However, if you are still on the fence check out my previous thoughts on why you should be getting a rice cooker in general below. It would seem unfair in my eyes to judge or evaluate an induction rice cooker from a non induction rice cooker (also given the overlap it wouldn’t make much sense either). We’ll be looking at induction rice cookers with the same eyes and criteria as we have our entire lives :). We decided to make this as easy as possible. We wanted to look at rice cookers that everyone in the US would have access to buy and that had a good amount of data that we could peruse through. We chose Amazon for its near ubiquitous use for online shopping, went straight for “best induction rice cookers”, sorted by customer ratings, and went down the list looking for anything that came up (minus paid promotions or advertisements). I’m pretty confident that we hit all the major players, we’ll definitely keep our eyes peeled for any revolutionary game changers that might come out. Stick with us while we continue our great journey into the hardware side of the culinary world!